Does your hefty metal bike lock clash with your stylish bike? Then check out this beautiful bike lock designed by Sono Mocci, which was shortlisted in Designboom’s ‘Seoul Cycle Design Competition 2010‘. Inspired by nature, the “Ivy” cable lock is modeled after crawling green vines and it’s sure to add a welcome burst of faux flora to even the most dreary urban environments. Soft, yet surprisingly durable, the lock is made of steel wire covered in silicon gum, features a 4-dial number lock, and comes in lengths of 35 inches or 55 inches. Piece of crap. If they actually sell that as a bike lock, that's totally irresponsible. Bike locks are "hefty" for a reason. I bike in nyc and that lock doesn't look it would protect anything. The lock looks like one of those cheap luggage lock and I'm sure that cable could be cut with little determination. Once again proving that form and function can never co-mingle :( That lock is useless! Does your hefty metal bike lock clash with your stylish bike? Then check out this beautiful bike lock designed by Sono Mocci, which was shortlisted in Designboom's 'Seoul Cycle Design Competition 2010'. 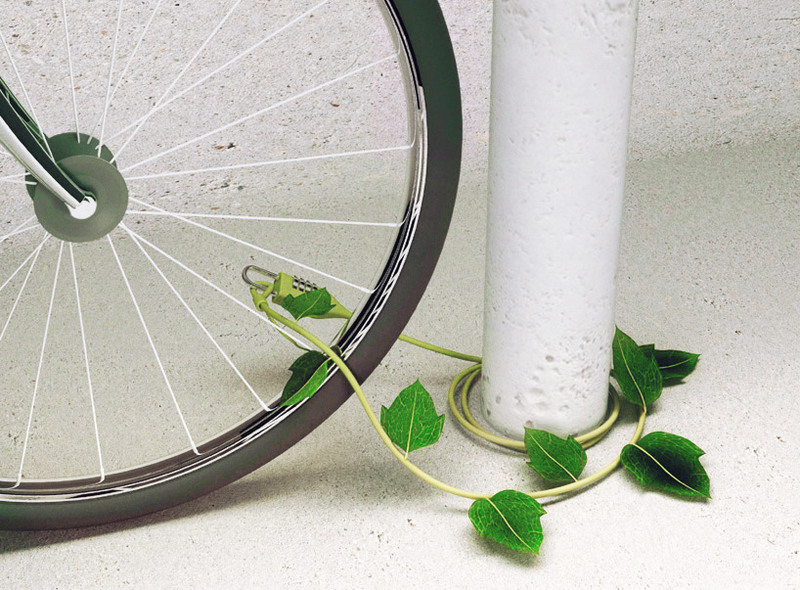 Inspired by nature, the "Ivy" cable lock is modeled after crawling green vines and it's sure to add a welcome burst of faux flora to even the most dreary urban environments. Soft, yet surprisingly durable, the lock is made of steel wire covered in silicon gum, features a 4-dial number lock, and comes in lengths of 35 inches or 55 inches.